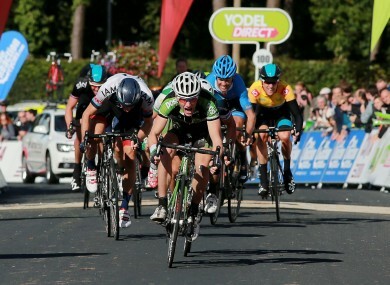 Bennett: biggest win of his career to date came at the Tour of Britain. SAM BENNETT CAN build on his reputation as one of Irish cycling’s top talents when he steps up to Pro-Continental level next season. Bennett landed a two-year deal with German team Netapp-Endura after a superb season which saw him win two stages of the An Post Rás and a stage at the Tour of Britain. The 23-year-old has been with the An Post Sean Kelly team at Continental level for the last three seasons but now steps up to Pro-Continental, the tier below the elite racers of the UCI World Tour. “It’s a bittersweet feeling with Sam,” team manager Kurt Bogaerts said. I am obviously delighted for him and he deserves this move because he is a very talented rider and he has worked extremely hard for this. At the same time he has been here for three years and I am sad to see him go. An Post Sean Kelly have moved to replace Bennett by signing 19 year-old Irish rider Ryan Mullent and British rider Owain Doull, both on one-year contracts. But they are also losing two of their most experienced riders with Donegal native Ronan McLoughlin and Belgian veteran Niko Eeckhout both leaving the squad. Email “One of Irish cycling's rising stars has signed a new professional deal”. Feedback on “One of Irish cycling's rising stars has signed a new professional deal”.